When you’re moving to a new home, not everything is going to fit into a standard moving box. An outdoor grill, for example, needs some special thought during the moving process. How are you going to get it there? Does it have to be cleaned? Will you have to remove the charcoal or propane tank? These are all questions you’ll have to ask. But what about those times when you can’t move in to your new home right away? If you’re staying with family or renting a hotel room for a short time because you had to move out of your old home before your new home was ready, chances are you’re not going to be able to bring all of your possessions along—that includes your grill. In this situation, you’ll probably rent a storage unit at a local self storage facility to temporarily house your grill and other household belongings. But before you roll it into a unit and call it a day, you need to prepare your grill for self storage. That means removing the fuel, cleaning the grill, and covering it with a grill cover. Whether you’re storing a gas or charcoal grill, it’s important to remove any type of fuel that could pose a threat to your storage unit and other surrounding units. Self storage operators typically make it a requirement for customers to remove the fuel source from the grill before it’s left in a storage unit to eliminate any chance of a fire hazard. “Whenever you’re storing for the winter or storing your BBQ grill for a longer period of time, it’s always a good idea to make sure you disconnect the tank,” says Kevin Kolman, Grill Master with Weber. With propane tanks, simply disconnect the fuel from the grill, and you’re good to go. Be sure to check with storage facilities before storing propane tanks, though, as most facilities won’t allow fuel sources to be stored inside units. If you’re going to store a charcoal grill, allow the coals to cool for at least 24 hours before removing them. Once they’ve cooled, wrap them up in an aluminum container, pour water on them, and throw them away in a metal trash can. Then, wipe out any excess ash from the grill’s lid and bowl. 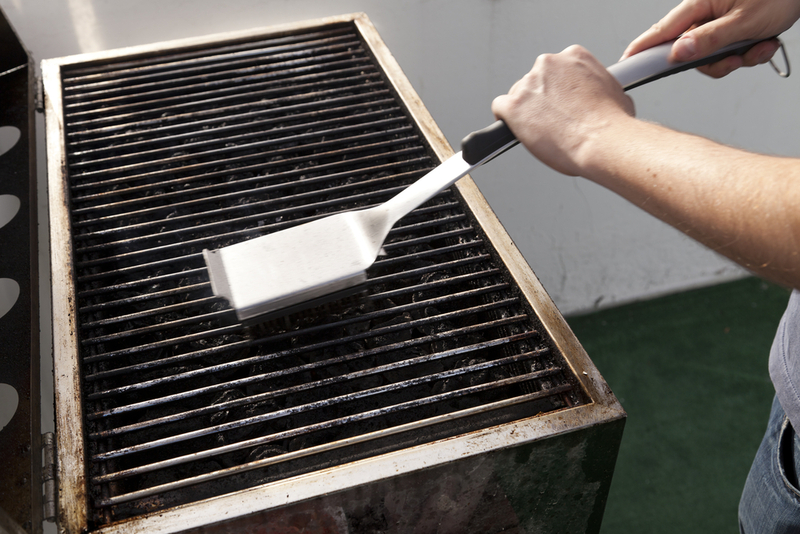 When cleaning your grill, Kolman says to avoid paper towels, especially if the grill is a stainless steel model. Scott Shemtov, Director of Marketing and Analytics for EmpirePatioCovers.com, which sells grill covers among other patio-related covers, says keeping a cover on a grill while it’s in self storage can be just as beneficial as using a cover when it’s outside on a patio or deck. Shemtov explains that it’s important to keep dust at a minimum on your grill while it’s in storage because dust causes minor abrasions that can damage your grill. Although you won’t have to store your grill for too long during a move, following these steps ahead of storage will ensure that your grill stays in good, working condition. Then, once you’re settled, you can break out the grill for a housewarming cookout! I am going to move to another house and I should pack my grill somehow. Thanks a lot for these useful advices about the grill! Regards! Carlshalton Carpet Cleaners Ltd.